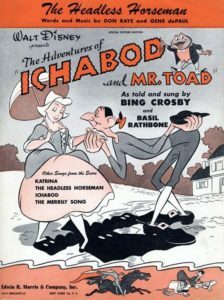 The Adventures of Ichabod And Mr. Toad was the last of Disney’s “package” features. After this, the animated features from Disney would go back to being complete stories, derived from fairy tales, literary classics, or contemporary children’s literature. Of course, you would expect there to be songs attached to both elements of this package. And you’d not be disappointed. Again, Tin Pan Alley virtually ignored one of the segments of this film, while concentrating on the other. 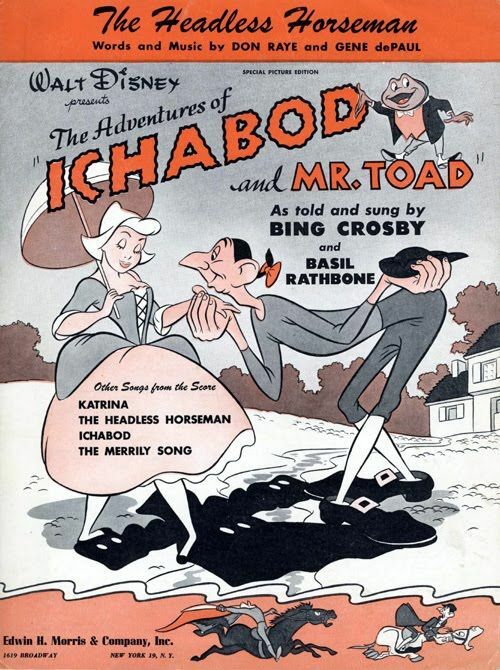 From Mr. Toad, the only song that got any action–at least from popular artists–as “Merrily On Our Way’, usually referred to as “The Merrily Song”. It appears that the only artist who tackled “The Merrily Song’ with its galloping six-eight rhythm, was the big band of Tex Beneke. RCA Victor issued his version on 20-3528. Unfortunately, the record–and the song–went nowhere. I can’t even post it for you – its that rare. Tin Pan Alley concentrated its interest on songs from the “Ichabod Crane” segment. And thereby hangs a bit of a tale. A lot of planning had already gone into both projects. And the songs from ‘Ichabod Crane” were already in place before 1947 was ended–nearly two years before the film was released. Bing Crosby recorded “Katrina” on Christmas Eve day, at Decca’s studio in Hollywood. Six days later, he cut the other two notable songs from “Ichabod Crane”–“Ichabod” and “The Headless Horseman”. Despite Bing’s giving these songs his all–and demonstrating that he still liked to show off some swinging jazz chops on “Horseman”–the records were relatively unsuccessful. Other recording firms were also taking notice. Columbia gave both “Katrina” and “The Headless Horseman” to Kay Kyser’s orchestra. In fact, Kyser got these sides in under the wire, recording the on December 31st–at the same session at which he cut “Woody Woodpecker”! Kyser’s version swung quite well, and was also graced (!) by a novelty vocal by one Freddie Froghammer. His Popeye-styled vocalizing has yet to be attributed to any particular member of the band. Capitol didn’t really bother with these–except that they gave “The Headless Horseman” to Kay Starr, a rising star at the firm. Kay was one of the few who could give Bing a run for his money on this song. Mercury gave both “Katrina” and “Ichabod” to a popular band whose base of popularity was shifting from the Midwest to the West Coast. 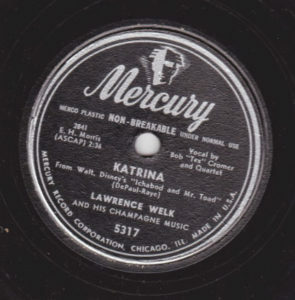 Lawrence Welk bubbled way with his Champagne Music on Mercury 5317. RCA Victor had Tex Beneke busy in the studio with sons from this picture. “The Headless Horseman” was coupled with the aforementioned “Merrily Song” on 20-3528. And “Ichabod” and “Katrina” were issued on 20-3527, right at the same time. With the release of the film imminent, Bing Crosby performed “The Headless Horseman” on his radio show of October 26, 1949. This version is a little looser–and happier–than the commercial recording of the clippety-cloppity piece. Bing also inserts a reference to Tex Beneke in this new version–and a reference to Hollywood’s aces of make-up, the Westmores. Of course, Disney would remember the “Horseman” opus. Around 1963, Thurl Ravenscroft was brought into the studio, given a semi-rock-and-roll backing, and did a version of the tune. The details of this recording are covered by my colleague Greg Ehrbar here. Of course, while all this was gong on, Disney, and the Santly-Joy interests, were gearing up for a project that promised to be big. And-as it happened–it was! Tune in next week for that! In the meantime, Happy Halloween! Appears to be Joe Morton, performing as Ferdie (instead of Freddie) Froghammer, doing his ‘Popeye’ voice. 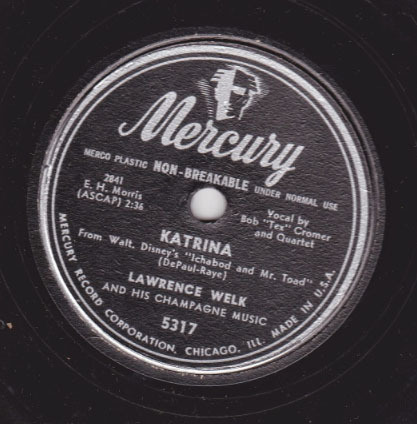 One more: Art Lund recorded “Katrina” for MGM Records, released on MGM 10508. Did Disney re-issue any of these “package” features as they did the “complete story” features? I do not remember package features showing up in theaters. I saw the individual stories on the Disney TV shows, but only the complete story features in theaters. I was born in 1948, so that may be my problem. Learning about all this music, is a delight. As far as I know Disney never re-released the package features in whole (except an edited version of THE THREE CABALLEROS in 1977). They did separate all the package sequences (or most of them) and reissued them as theatrical shorts. Many of them had frequent airplay on Disney’s Sunday night shows as well. 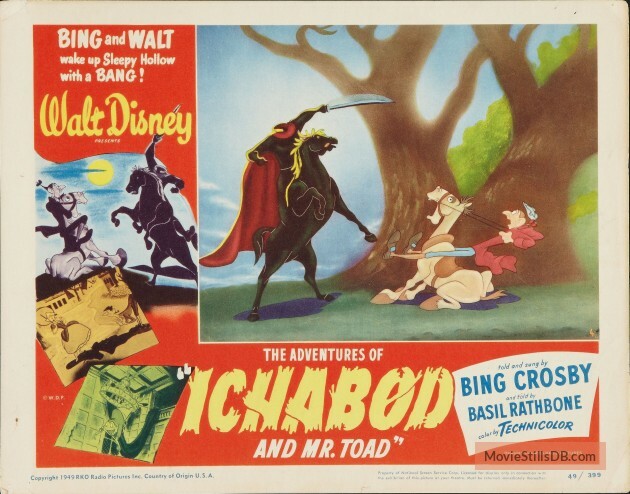 For the record, Ichabod was re-released theatrically as a separate theatrical short, THE LEGEND OF SLEEPY HOLLOW on Thanksgiving 1958 (possibly connected to the feature film, TONKA). The “Mr. Toad” sequence was also re-released theatrically in England as “Wind and The Willows” in March 1967, and in the United States as THE MADCAP ADVENTURES OF MR. TOAD in December 1975. You do mean it was re-released in England as “Wind *in* the Willows”, right? As in, the title of the famous British children’s book it’s based on, Kenneth Grahame’s “The Wind in the Willows”. Yes, I made a typo. According to Dave Smith’s Book “Disney A to Z” it was released in England as “Wind In The Willows”. You are correct. With the exception of Caballeros (about which Jerry is correct — I was front and center at that reissue) my recollection is the first time domestic audiences ever saw the other package features intact was on the original Disney Channel, and it was quite a thrill. Weren’t all the “package” features released for the non-theatrical market on 16mm? Swank Motion Pictures and Ideal rented them, and Disney licensed them to many other 16mm rental companies. Yes, most (but not all) of the package features were released in the non-theatrical market. I used to rent them to schools and colleges in 16mm when I worked for UA 16 way back when. (The previous question above – and my response – was about theatrical reissues). Thank you Jerry for the info on the non-reissues of the “package features”. When Freaky Friday was again on the screens, a few months after II first saw it, I went to see it again because THE THREE CABALLEROS was also on the bill. I was not only surprised that much of CABALLEROS was edited out, but I was also surprised that the very end of Freaky Friday had also been changed.